You may have requirement to capture user parameters, before navigating to actual page. This can be implemented by opening ADF popup during page load. User provides required information and confirms it by closing popup - actual page is rendered based on dialog action. 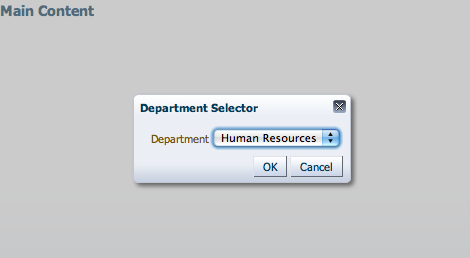 Such functionality can be very useful, when we need to set bind variable value for VO, based on user input. 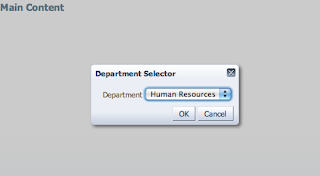 Instead of building separate data entry page, we can handle user data entry from on-load popup. Thanks for the info.. Never know this simple shortcut.. We used to put in page phase listener. I'm happy this was useful ! thank you for this post!! I really appreciateyour blog! Thank you for your work! How do i achieve this for a jsff ? Unfortunately there is no such quick hint for JSF Fragment. I plan to post solution for this - on my todo list. have you figured out how to launch the popup in jsff? So far we managed to store the JS script in JSFF, and use clientListener from JSPX to launch the popup. However, we have to launch it based on some backing bean calculation. It remains a pain. I am not answering on behalf of Andrejus, but can suggest a simple approach. Jaspal - thanks for helping on this. Thanks for this nice tip. Its really helpful. 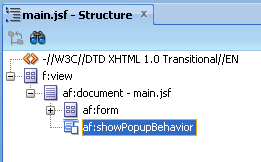 Is there any approach for opening ADF popup during jsff page load to capture user parameters.? I tried the approach mentioned by Mr.Jaspal . But it didn't work for me. Thank you so much for you post. All of your post is very effective and helpful in real time application. As a follower of your blog currently I am facing a new problem. I want to open a pop up on jsff page load.I know how to do that. 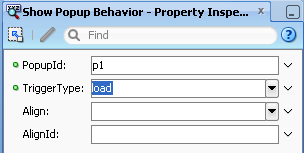 It's working when i placed the task flow in a region on main page. But it's not working on Dynamic region. Could you please guide me to resolve this problem. This is a good question. I will plan a new blog post to answer it.